The scouts in Troop 353 have a wonderful way to contribute to their community each year in January by performing the opening flag ceremony at the always well-attended celebration of Dr. Martin Luther King, Jr. Breakfast (sponsored by Eastchester Community Action Program – ECAP). In addition to earning valuable community service hours, the scouts are entitled to a complete breakfast for free! Ths hugely popular event draws large participation from schools and churches throughout the tri-community area. Additionally, several important dignitaries are always in attendance along with members of the press. This wonderful annual tradition is celebrated several hundred people. This year’s event took on special relevance as everyone present realized Dr. Martin Luther King’s “I have a Dream” speech was finally coming to fruition with the inauguration of the first African American President, Barack Obama that same week. (Photos here). During the yearend holidays our troop attempts to reunite many of our Eagle Scouts that are typically home for the holidays. One of the better ways to create a sense of belonging, while cultivating an effective environment for the younger scouts to learn from the older scouts, is to go on a hike! Our area is blessed with many great hiking areas within a 45 minute drive. A favorite hike of many locals is Anthony’s Nose. Led by Eagle Scouts, Dan A. 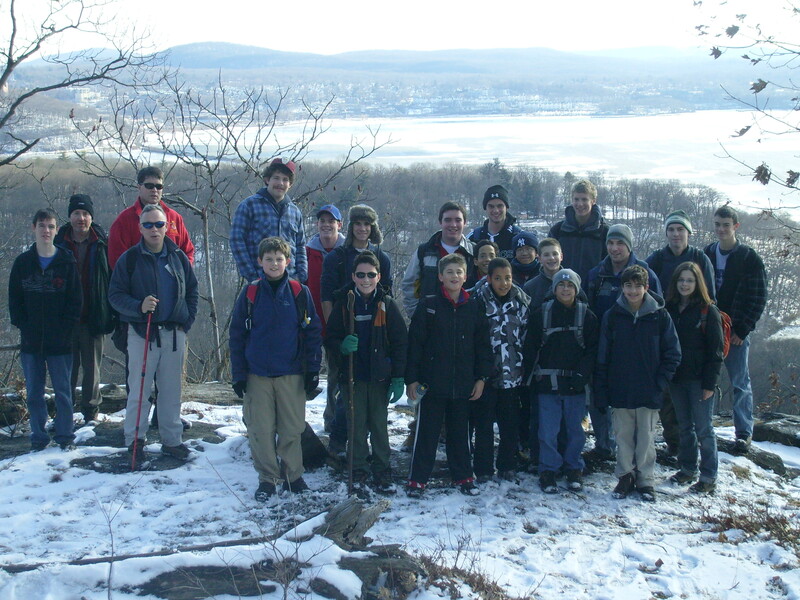 & Evan W., our cadre of 25 hikers, including 5 Eagle Scouts, enjoyed a beautiful day of January sunshine. It has been about 3 years since our troop last tackled Anthony’s Nose. And with some snow & ice present, the trek was a bit more arduous and slow-gowing than anticipated. After the hike, it was estimated that the Camp Smith trail to Anthony’s Nose criss-crossed 3 peaks, resulting in a cumulative elevation climb of well over 2000 feet–which explains why so many were so tired and slept well that night! Hiker pics are here!